How do you reach a large audience who might not have access to the internet or mobile devices? That’s the question Ghana asked itself just over a decade ago. Farmers weren’t getting access to the information they needed in order to improve agricultural techniques and boost food production. So the country took a fresh approach: since 2004 it’s been talking to them on the radio, providing up-to-date information about agriculture in local languages. Using radio was a deliberate move. Agriculture - once the backbone of Ghana’s economy, is widely seen as the key to tackling poverty. Overtaken by the service industry in 2006 in terms of contribution to Ghana’s GDP, it employs around 60% of the population and in economic terms, props up 80%. But Ghana’s peasant farmers – who produce the bulk of the country’s food - are largely illiterate, with limited access to newer Information Communication Technologies (ICTs) like the internet and computers. They’ve struggled to sustain increased levels of food production over the last decade, and as such a higher value than ever has been placed on all ICTs, including older varieties like TV, newspaper, radio and landline phones. 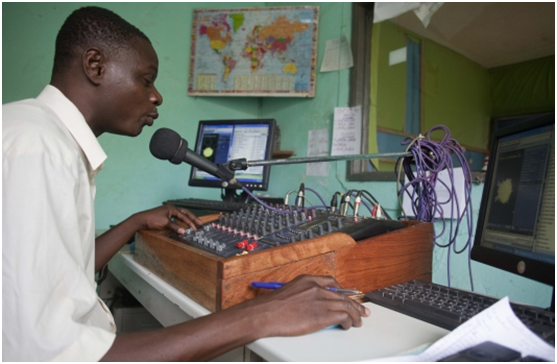 The country’s Ghana Agricultural Information Network (GAINS) spearheaded the ‘farmer-radio’ initiative. Set up in 1991 to tackle the task of sharing agricultural research and information, GAINS has benefitted scientists and academic researchers enormously. However, information wasn’t filtering down to farmers. Radio sets are cheap. They beat distance, cross time. Farmers like the informality of spoken broadcasts and the updates they get come in their own local languages. Thanks to the radio shows farmers can identify problems in their farming techniques and find solutions. They can boost their earnings too, and keep up with current innovations in agricultural research, promoted through more formal channels by GAINS. Community radio stations broadcast live for an hour once a week, with a repeat broadcast in the coming fortnight depending on the station. The show’s format is based on an analysis of farmers’ questions in the previous week to either the radio station or GAINS’ coordinating centre in Accra, (GAINS has managed a popular agricultural Question and Answer service since 2000). A show’s line-up is advertised a week in advance so listeners know what to expect, and topics are discussed for around half an hour. ‘Resource staff’ - agricultural experts from an academic or experience-based background, are on hand to talk through the issues, and following the show farmers can phone in or text with questions. Those who don’t have phones are encouraged to drop by the station in person to share their insights. And anyone who misses a show can get a copy of the broadcast at their local radio station. While there have been bumps in the road - radio hosts aren’t always inspiring; local language barriers means that experts on the show have to be translated live from English, and one hour shows don’t always get to the heart of the matter – surveys have shown Ghana’s farmer radio shows to be a big success. It’s a nifty way of connecting the dots between policy makers, researchers and ground-level agriculture. And, perhaps more importantly, Ghana’s radio phone-ins give farmers a voice. As always, we’d be interested to hear what you think! Read the full paper by Joel Sam and Lucy Dzandu, published on AgInfo Worldwide, here.